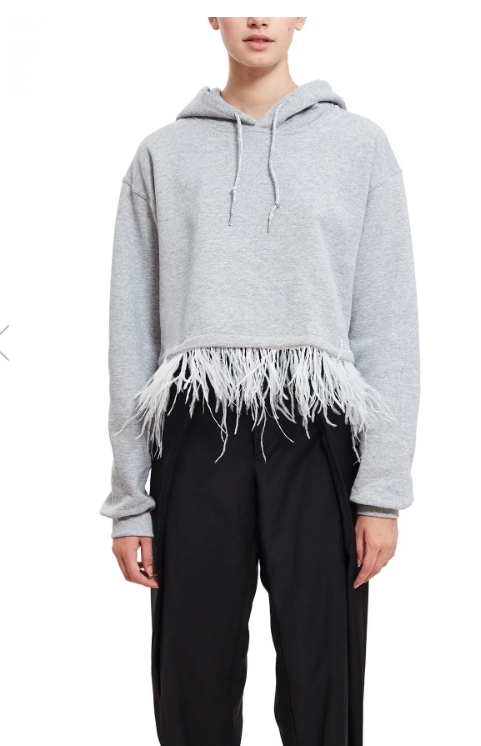 This next trend is a bit kooky, but it's fun, and I think it transcends style—you can wear feathers in an edgy way or a feminine way, or in many ways in between. 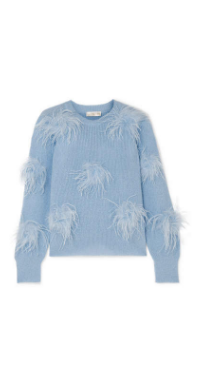 It's also a bit easier to find on the higher end (Net-a-Porter has a wealth of feather-trimmed stuff), but there are lots of affordable options out there too. 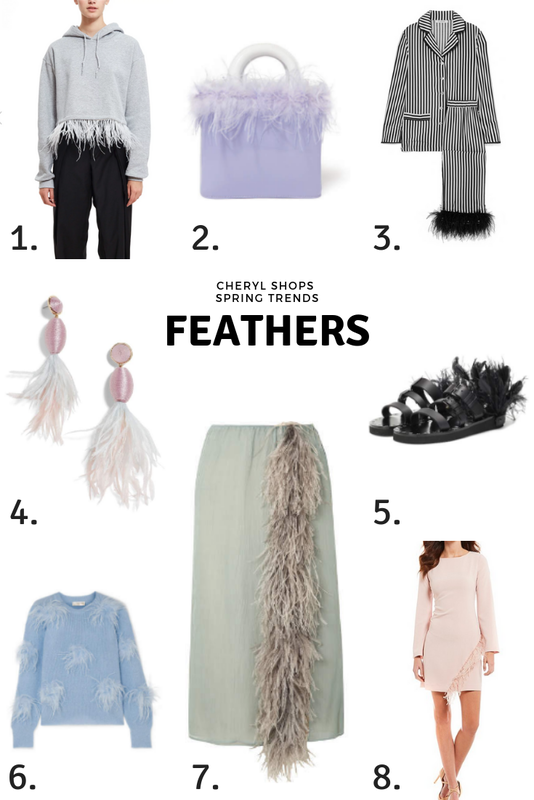 Here are my favorite feather-trimmed pieces for spring 2019. 2. This bag is two trends in one—lavender and feathers—and it's also a little impractical, but it has the potential to totally make your outfit. 3. 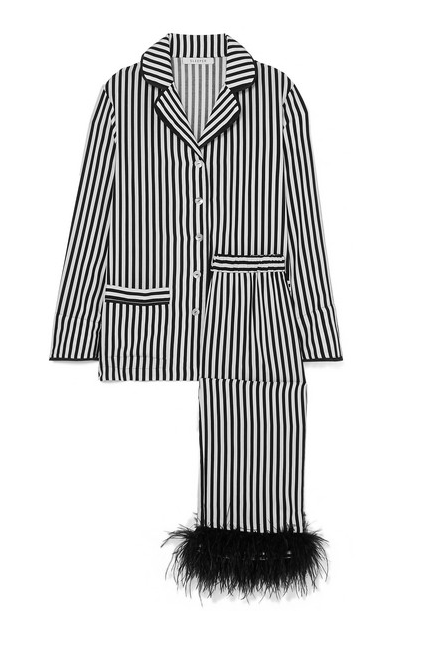 These are pretty much the most fabulous pajamas I've ever seen, and they're so great, I think you could get away with wearing them (separately) during the day. Bonus points for the name. 4. 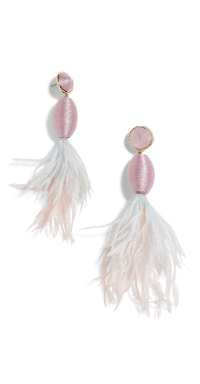 If you are feeling a little unsure about this whole feather trend, earrings are a pretty safe bet. I have a similar pair, and they make me feel like I have big, fancy hair extensions. Bonus: these are easy on the wallet. 5. These sandals are are hard to find—they're nearly sold out everywhere, and I can see why. 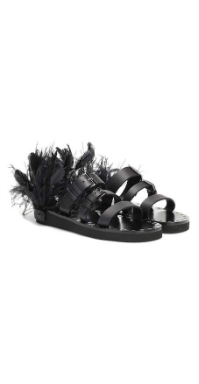 They look comfy and like they go with lots of things, but the feathers at the heel are whimsical and unexpected. If you see them anywhere in a 39, let me know! 6. I'm obsessed with Stine Goya—it's a Danish brand that I plan to shop like mad when I'm in Copenhagen later this year. Their clothes are kind of out there, but in a wearable way (if that makes any sense). 7. Giving credit where it's due, Prada is the brand that's pretty much responsible for this trend, and they're executing it in one of the best ways—look how rich and full that swath of feathers looks along the front of this skirt. This is definitely a splurge, but one that's truly a statement. 8. 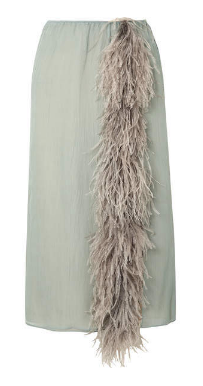 I love this dress because the feathers are so subtle, you could probably get away with wearing this to work, although it could certainly work for a dressier event (like a wedding) as well. It's also on sale, and that never hurts! I've always loved feather pieces! I have on feather trimmed dress and it's so fun! That blush dress is just stunning and even feathers on PJ's! What a hoot! The feather earrings are so fun! :) I've had feather trimmed shoes before but they were tickely to wear, haha! Hope you have a lovely weekend ahead of you :) Another busy one here! Love it! What a lovely colors. oooooh you're so right- I've been seeing this trend everywhere now!! Definitely excited to experiment with it and play around with some textures.